Paradise Cove is the perfect, dream destination for a tropical, paradise wedding. Envision arriving at a private beachfront estate surrounded by tropical gardens and bushland, white, sand beaches and coconut palm trees—all with an oceanfront view of the glimmering coral sea. Who doesn’t want a secluded, private beachfront estate for their wedding day? Enter the luxury, hideaway estate and be enchanted by the exotic combination of Indian and African heritage inspired interiors, furniture and décor. 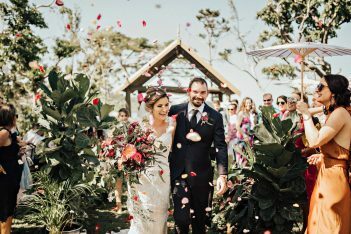 Then, exit out onto manicured lawns and wooden boardwalks to capture the most beautiful and memorable photographs you can dream of. Your day will be truly unique and unforgettable whether you decide to marry by the Balinese-inspired pool, or under a romantic, starlight sky in the lush gardens, or even on the pristine beach, surrounded by natural beauty. Paradise Cove Resort offers a relaxing atmosphere to ensure your wedding day is as smooth as possible, but there are also plenty of free activities to keep guests entertained in between events—including paddle boarding, kayaking, toasting marshmallows in the fire pit, a pool table and a tennis table, as well as a tennis court, basketball net and football. Less adventurous guests can relax in a hammock with a book or chill out in the pool or adjoining jacuzzi. There’s also a variety of catering options for your reception— everything from a seven-course banquet feast to a traditional drop menu. Sink your teeth into an Aussie style spit roast barbeque, indulge in glorious seafood buffet options, or enjoy casual canapes with your friends and loved ones. Plus, you’ll be delighted to know that Paradise Cove Resort allows BYO beverages—being one of the only venues in Airlie Beach that allows BYO. You have the option to allow us to collect your order from a local supplier (along with supplied glassware, fancy garnishes, and waitstaff), or you can choose one of our full beverage packages complete with signature cocktails. Guests will feel comfortable and accommodated across the selection of private shared cabins and the choice of 5 luxurious villas—including the Dream Villa which is the ultimate honeymoon suite. The spacious, private villa has large windows for ocean views, a free-standing bathtub and exquisite, ensuite bathroom. It’s an ideal, romantic couple’s retreat for your special day. 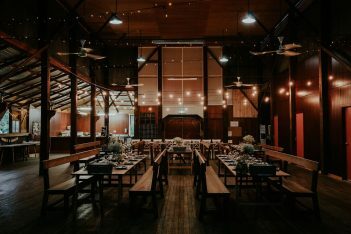 Other rooms include the Rainforest Retreat, the Private King Cabins and Shared King Cabins, which offer plenty of variety for members of your wedding party. Plus, you and your guests will wake up after a refreshing sleep in paradise to a continental breakfast and enjoy full use of the resort facilities prior to departure. All packages include transport to and from Paradise Cove for the bride, groom, bridal party and all guests. Typically, transportation to the resort is via bus transfer, but couples seeking a more memorable and exclusive entrance to their wedding can enquire about a helicopter, seaplane, or private jet boat upgrade for an unforgettable journey along the coast and stylish arrival at beautiful Paradise Cove Resort. Paradise Cove Resort is run by a multi award winning Adventure Tourism company called Red Cat Adventures. Red Cat Adventures offer 3 different tours around the Whitsunday Islands, including sailing on Tongarra and travelling on our custom built speed catamarans, Thundercat and Wildcat. Our tours visit places such as the world famous Whitehaven Beach, Hill Inlet Lookout and snorkelling on the fringing Great Barrier Reef.